Faculty Men - S/T - This is another one where I was hopeful based on the artwork, but this time I didn't end up being as into it as I hoped. Faculty Men is playing a dissonant sort of punk rock. If I had to guess, I think they might be trying for an early Unwound sort of vibe. They are using some of the thudding bass guitar, screeching guitars and odd transitions that remind my of Unwound, though vocally, the singer from Faculty Men isn't quite as dynamic. There's a lot of shouting and that takes away from the interesting guitar work these guys have. 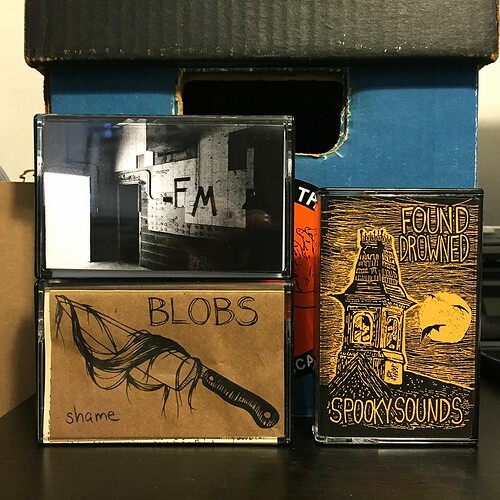 Blobs - Shame - Six more songs from Blobs, who you probably remember from me not liking their first cassette yesterday. What I can say about Shame is that it's a bit better than their debut. The vocals aren't quite as monotone as they were on their first tape, but they are still the worst thing about this band. I think the music portion is kind of interesting. It's fast and dynamic; even catchy in some places, but I could never listen to this unless the singer changes something. Found Drowned - Spooky Sounds - I was very please to find out that Found Drowned was another surf band. As far as More Power Tapes goes, in general they do much better with their surf bands than with their punk bands. At least as far as getting me to like the record goes. Like the Hamiltones, Found Drowned has something of a movie monster vide to it, though it's not as pronounced as the Hamiltones. You can tell these guys like their cult horror movies (the tape is called Spooky Sounds afterall), but they don't beat you over the head with it. Of all the surfy tapes in this recent batch, Found Drowned is my favorite.